The Islamic Financial Services Act (IFSA) 2013 provides regulation and supervision for Islamic financial institutions and promotes financial stability and compliance with the Shari'ah. IFSA came into force on 30 June, 2013. It requires Islamic financial institutions to ensure that their objectives, operations, businesses, affairs and activities are Shari'ah-compliant at all times. The money accepted for an Islamic deposit must be repaid to the depositor in full while there is no express or implied obligation to repay in full the money of an investment account (IFSA, 2013: 18). The contracts by which customers opened mudarabahbased Islamic deposits before IFSA never mentioned a guarantee of the principal. That is because the well known general fiqh rule for the mudarabah contract is that stipulating a guarantee of principal is not allowed. mudarabah is a contract that entails the sharing of profit based on the agreed ratio and the bearing of loss by the capital provider. Despite that, the previous banking act mentioned mudarabah-based deposits in the same category as current and savings accounts; thus the regulator considered them as liabilities of the banks. Because of that they were covered, like other accounts, by PIDM (a Malaysian government agency that insures bank deposits up to a certain amount), which made depositors comfortable. IFSA has made it clear that the regulator no longer considers mudarabah-based deposits as a type of CASA account. mudarabah-based deposits are explicitly mentioned as a separate category: investment accounts. In case the funds in an investment account are exposed to loss, the depositor is supposed to bear the loss, and the bank has no express or implied obligation to repay the amount in full. PIDM’s guarantee extends only to banks’ obligations. Since a bank has no obligation to pay back the principal that is lost in an investment account when the loss is due to factors beyond its control, PIDM’s guarantee also assumes no responsibility for such accounts. 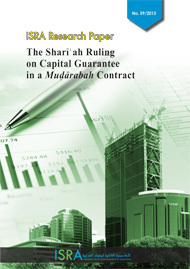 The question at hand is whether the mudarabah account can be maintained as an Islamic deposit but with the element of principal guarantee?especially as there are contemporary views in favour of adding the principal guarantee aspect to mudarabah under some conditions?or does it need to be replaced with other contracts that can accommodate the element of principal guarantee? Given these questions and circumstances, it is important to examine the Shari'ah ruling on principal guarantee in a mudarabah contract and explore potential alternatives to mudarabah-based CASA for further deliberation and research. There are three opinions regarding the Shari'ah ruling on principal guarantee in a mudarabah contract. The first is that it is impermissible to stipulate in the contract that the mu?arib is liable to guarantee the mudarabah capital. The second is that it is permissible to guarantee the mudarabah capital by way of a stipulated condition. The third is that the mu?arib can be held liable to guarantee the mudarabah capital in case he volunteers to do so at the inception of the contract or in the event of capital loss. The contemporary mudarabah-based deposit is implemented in the banking industry, which is a heavily regulated industry. The mudarabah capital in a CASA Islamic deposit is almost a secured mudarabah structure due to the implementation of capital adequacy requirements. Contemporary mudarabah deposit and investment accounts are equipped with income smoothing techniques such as the Profit Equalisation Reserve (PER) or Investment Risk Reserve (IRR) in order to mitigate displaced commercial risk (DCR).